A flower, sometimes known as a bloom or blossom, is the reproductive structure found in flowering plants (plants of the division Magnoliophyta, also called angiosperms). The biological function of a flower is to effect reproduction, usually by providing a mechanism for the union of sperm with eggs. Flowers may facilitate outcrossing (fusion of sperm and eggs from different individuals in a population) or allow selfing (fusion of sperm and egg from the same flower). Some flowers produce diaspores without fertilization ( parthenocarpy). Flowers contain sporangia and are the site where gametophytes develop. Many flowers have evolved to be attractive to animals, so as to cause them to be vectors for the transfer of pollen. 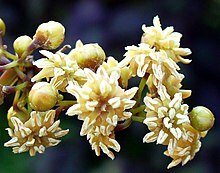 After fertilization, the ovary of the flower develops into fruit containing seeds. Main parts of a mature flower ( Ranunculus glaberrimus). Although the arrangement described above is considered "typical", plant species show a wide variation in floral structure. These modifications have significance in the evolution of flowering plants and are used extensively by botanists to establish relationships among plant species. 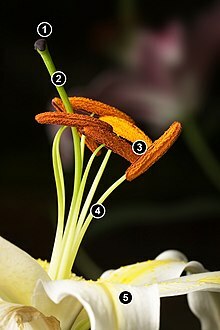 The four main parts of a flower are generally defined by their positions on the receptacle and not by their function. Many flowers lack some parts or parts may be modified into other functions and/or look like what is typically another part. In some families, like Ranunculaceae, the petals are greatly reduced and in many species the sepals are colorful and petal-like. Other flowers have modified stamens that are petal-like; the double flowers of Peonies and Roses are mostly petaloid stamens. 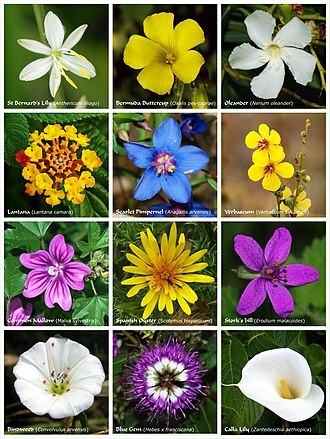 Flowers show great variation and plant scientists describe this variation in a systematic way to identify and distinguish species. The first step of the transition is the transformation of the vegetative stem primordia into floral primordia. This occurs as biochemical changes take place to change cellular differentiation of leaf, bud and stem tissues into tissue that will grow into the reproductive organs. Growth of the central part of the stem tip stops or flattens out and the sides develop protuberances in a whorled or spiral fashion around the outside of the stem end. These protuberances develop into the sepals, petals, stamens, and carpels. Once this process begins, in most plants, it cannot be reversed and the stems develop flowers, even if the initial start of the flower formation event was dependent of some environmental cue. Once the process begins, even if that cue is removed the stem will continue to develop a flower. Flowering plants usually face selective pressure to optimize the transfer of their pollen, and this is typically reflected in the morphology of the flowers and the behaviour of the plants. Pollen may be transferred between plants via a number of 'vectors'. Some plants make use of abiotic vectors — namely wind ( anemophily) or, much less commonly, water ( hydrophily). Others use biotic vectors including insects ( entomophily), birds ( ornithophily), bats ( chiropterophily) or other animals. Some plants make use of multiple vectors, but many are highly specialised. Anemophilous: flowers use the wind to move pollen from one flower to the next, examples include the grasses, Birch trees, Ragweed and Maples. They have no need to attract pollinators and therefore tend not to grow large blossoms. Whereas the pollen of entomophilous flowers tends to be large-grained, sticky, and rich in protein (another "reward" for pollinators), anemophilous flower pollen is usually small-grained, very light, and of little nutritional value to insects, though it may still be gathered in times of dearth. Honeybees and bumblebees actively gather anemophilous corn ( maize) pollen, though it is of little value to them. Among North American plants, weeds are the most prolific producers of allergenic pollen. Ragweed is the major culprit, but other important sources are sagebrush, redroot pigweed, lamb's quarters, Russian thistle (tumbleweed), and English plantain. Besides the hard proof of flowers in or shortly before the Cretaceous,   there is some circumstantial evidence of flowers as much as 250 million years ago. 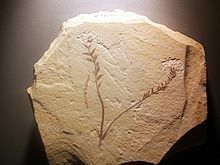 A chemical used by plants to defend their flowers, oleanane, has been detected in fossil plants that old, including gigantopterids,  which evolved at that time and bear many of the traits of modern, flowering plants, though they are not known to be flowering plants themselves, because only their stems and prickles have been found preserved in detail; one of the earliest examples of petrification. The similarity in leaf and stem structure can be very important, because flowers are genetically just an adaptation of normal leaf and stem components on plants, a combination of genes normally responsible for forming new shoots. The most primitive flowers are thought to have had a variable number of flower parts, often separate from (but in contact with) each other. The flowers would have tended to grow in a spiral pattern, to be bisexual (in plants, this means both male and female parts on the same flower), and to be dominated by the ovary (female part). As flowers grew more advanced, some variations developed parts fused together, with a much more specific number and design, and with either specific sexes per flower or plant, or at least "ovary inferior". 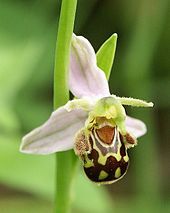 Many flowering plants reflect as much light as possible within the range of visible wavelengths of the pollinator the plant intends to attract. Flowers that reflect the full range of visible light are generally perceived as white by a human observer. An important feature of white flowers is that they reflect equally across the visible spectrum. While many flowering plants use white to attract pollinators, the use of color is also widespread (even within the same species). Color allows a flowering plant to be more specific about the pollinator it seeks to attract. The color model used by human color reproduction technology ( CMYK) relies on the modulation of pigments that divide the spectrum into broad areas of absorption. Flowering plants by contrast are able to shift the transition point wavelength between absorption and reflection. If it is assumed that the visual systems of most pollinators view the visible spectrum as circular then it may be said that flowering plants produce color by absorbing the light in one region of the spectrum and reflecting the light in the other region. With CMYK, color is produced as a function of the amplitude of the broad regions of absorption. Flowering plants by contrast produce color by modifying the frequency (or rather wavelength) of the light reflected. Most flowers absorb light in the blue to yellow region of the spectrum and reflect light from the green to red region of the spectrum. For many species of flowering plant, it is the transition point that characterizes the color that they produce. Color may be modulated by shifting the transition point between absorption and reflection and in this way a flowering plant may specify which pollinator it seeks to attract. Some flowering plants also have a limited ability to modulate areas of absorption. This is typically not as precise as control over wavelength. Humans observers will perceive this as degrees of saturation (the amount of white in the color). Irises/ Lily are used in burials as a symbol referring to "resurrection/life". 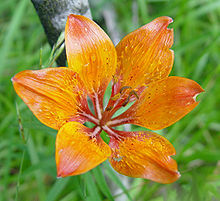 It is also associated with stars (sun) and its petals blooming/shining. 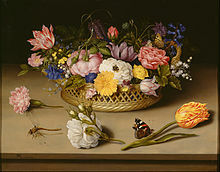 Flowers within art are also representative of the female genitalia,  as seen in the works of artists such as Georgia O'Keeffe, Imogen Cunningham, Veronica Ruiz de Velasco, and Judy Chicago, and in fact in Asian and western classical art. Many cultures around the world have a marked tendency to associate flowers with femininity. Flowers provide less food than other major plant parts ( seeds, fruits, roots, stems and leaves), but still provide several important vegetables and spices. Flower vegetables include broccoli, cauliflower and artichoke. The most expensive spice, saffron, consists of dried stigmas of a crocus. Other flower spices are cloves and capers. Hops flowers are used to flavor beer. Marigold flowers are fed to chickens to give their egg yolks a golden yellow color, which consumers find more desirable; dried and ground marigold flowers are also used as a spice and colouring agent in Georgian cuisine. Flowers of the dandelion and elder are often made into wine. Bee pollen, pollen collected from bees, is considered a health food by some people. Honey consists of bee-processed flower nectar and is often named for the type of flower, e.g. orange blossom honey, clover honey and tupelo honey. Flowers have been used since prehistoric times in funeral rituals: traces of pollen have been found on a woman's tomb in the El Miron Cave in Spain. Many cultures draw a connection between flowers and life and death, and because of their seasonal return flowers also suggest rebirth, which may explain why many people place flowers upon graves. The ancient Greeks, as recorded in Euripides's play The Phoenician Women, placed a crown of flowers on the head of the deceased;  they also covered tombs with wreaths and flower petals. Flowers were widely used in ancient Egyptian burials,  and the Mexicans to this day use flowers prominently in their Day of the Dead celebrations  in the same way that their Aztec ancestors did. The flower-giving tradition goes back to prehistoric times when flowers often had a medicinal and herbal attributes. Archaeologists found in several grave sites remnants of flower petals. 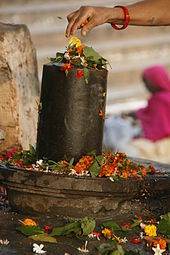 Flowers were first used as sacrificial and burial objects. Ancient Egyptians and later Greeks and Romans used flowers. In Egypt, burial objects from the time around 1540 BC[ citation needed] were found, which depicted red poppy, yellow Araun, cornflower and lilies. Records of flower giving appear in Chinese writings and Egyptian hieroglyphics, as well as in Greek and Roman mythology. The practice of giving a flower flourished in the Middle Ages when couples showed affection through flowers. ^ Ausín, I.; et al. (2005). "Environmental regulation of flowering". Int J Dev Biol. 49 (5–6): 689–705. doi: 10.1387/ijdb.052022ia. PMID 16096975. ^ Turck, F.; Fornara, F.; Coupland, G. (2008). "Regulation and Identity of Florigen: Flowering Locus T Moves Centre Stage". Annual Review of Plant Biology. 59: 573–594. doi: 10.1146/annurev.arplant.59.032607.092755. hdl: 11858/00-001M-0000-0012-374F-8. PMID 18444908. ^ Searle, I.; et al. (2006). "The transcription factor FLC confers a flowering response to vernalization by repressing meristem competence and systemic signaling in Arabidopsis". Genes Dev. 20 (7): 898–912. doi: 10.1101/gad.373506. PMC 1472290. PMID 16600915. ^ Soltis, Douglas E.; Soltis, Pamela S. (2004). "Amborella not a "basal angiosperm"? Not so fast". American Journal of Botany. 91 (6): 997–1001. doi: 10.3732/ajb.91.6.997. PMID 21653455. Archived from the original on 2010-06-26. Retrieved 2010-08-30. ^ Sauquet, Hervé; et al. (1 August 2017). "The ancestral flower of angiosperms and its early diversification". Nature Communications. 8: 16047. doi: 10.1038/ncomms16047. PMC 5543309. PMID 28763051. Archived from the original on 2 August 2017. Retrieved 1 August 2017.